There’s no substitute for meeting someone in person if you hope to gain a sense of their personality, character, and competence. That’s why many of the most competitive colleges in the country conduct college interviews, and you’d be surprised at how well a good impression in person can help your chances of admission. If you come across as driven, passionate, competent, and likable in a college (or job) interview, your chances of making a favorable impression on the interviewer (and, by extension, the organization he or she represents) is much higher than it would be without the interviewer ever having met you. Given that you’re likely to face at least one college interview in your lifetime, as well as several job interviews, it’s extremely wise to practice handling yourself in a professional interview setting. Doing so involves more than simply memorized scripted responses and delivering them on cue, however. Rather, solid interview preparation involves practicing interacting with new people in a confident, yet receptive manner, mastering the art of conversational give and take, and making people remember you in a positive light. Although there’s no surefire way of knowing exactly what questions will be asked of you during your college (or job) interview, there are several classic interview questions that are quite likely to crop up, and it’s wise to practice answering them with people in a mock interview setting. The goal is not to memorize a sound bite, but rather to speak off the cuff in a precise, conversational way, always illustrating your general claims with specific references to aspects of your work or life experience in a way that allows the interviewer to ask for further details if he or she desires. Let’s speculate on some of the questions you might be asked in that important interview and consider some ways in which you might respond to each potential question! Ah, the open-ended “tell me about yourself” question. What on earth should you possibly say? The interviewer is asking this question because he or she is interested in your own perception of yourself. What you say should be carefully selected to present a compelling portrait of your personality, goals, experience, and interests. A good response to this question should telegraph 1) your background 2) your passion 3) your goals, while giving the interviewer a sense of your personality. Limit your response to one or two sentences, and be sure to drop in references to specific things that the interviewer can ask you to expand upon. 2) Why Are You Applying to This College (or Job)? They’re asking you this question to see whether or not you want to attend this college or work this job as opposed to any college or any job. That’s why, in order to answer this question successfully, you need to telegraph to the interviewer that you’ve done your homework. For a job interviewer, you want to make clear that you understand the company’s culture, history, and vision, and most importantly, that they need you to help realize that vision; be able to articulate exactly how you’ll be an asset to them; include specifics upon which you can expand if asked. In order to understand you better, interviewers want to gain a sense of how you understand yourself. By asking what your strengths are (academic, job-related, or personal), interviewers see what traits and accomplishments you prioritize. These will give them a clue as to what you might enjoy or excel at at their organization. Don’t be afraid to brag! 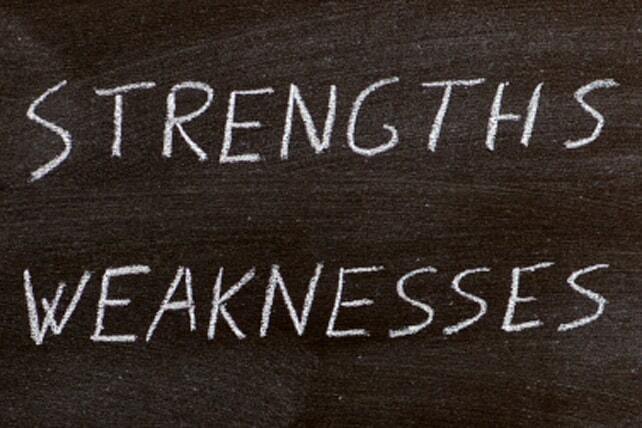 The interviewers are asking this question to gain a sense of what you perceive to be your weaknesses. Don’t say that you’re a perfectionist. Be honest. Select a weakness (ideally one unrelated to the task at hand) and frame it as something you realized long ago and have already been working (with demonstrable progress) to address. Show self-awareness, humility, and the ability to learn and grow with this answer. If you’re going to major in English and are truly weak in math, there’s nothing wrong with mentioning that! Mention attending tutorials and seeking out extra practice problems online, then tell the interviewer how you were able to get an A on a recent exam when you’d previously been earning Bs. That’s the way to handle a “weakness” question. You need to answer the question in an honest way, and you need your answer to telegraph to the interviewer that you understand yourself and will be an asset to their college or organization. 5) Where Do You See Yourself in Five or Ten Years? This one’s easier if you’re applying for college; less so if you’re applying for a job. For college, you should research jobs that people in your proposed major field of study have gone on to acquire. Discuss 1) what you’d like to do, always connecting it to your passions 2) give specifics but don’t seem too attached to any one vision; show you’ve got options, and 3) you can always mention graduate school and a PhD program even if you may not truly attend one. For a job, you want to make clear that you’re passionate about the work you’ll be doing and about the company’s vision. Mention other skills you have as well. Say that if you’re a good fit with the company, as you expect to be, you hope to continue to find ways to contribute and move the company forward, giving specifics if possible. Explain that you’re excited to see where the company will be in ten years; you can even ask the interviewer this question, as it’s a really good one to ask. Hopefully this article’s helped give you some idea of 5 major questions you might be asked in a college (or job) interview. Don’t forget to practice with a friend or family member. Record yourself practicing and watch and listen to the recording, if you can bear to do so. You’ll learn a lot. It’s difficult to come across as natural and genuine. It requires genuine relaxation, comfort, great listening, and an ability to connect with people. Listen to what they say and respond in kind. Make appropriate eye contact. A combination of relaxation and confidence will show the interviewer you’re competent, level-headed, talented, and understand yourself and their organization’s needs. Good luck!